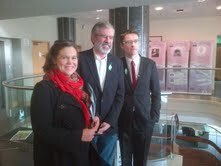 Today Sinn Féin is holding a conference in Liberty Hall looking at the last century of workers in struggle. I gave the opening speech, welcoming guest speakers, setting the historical context, and raising the issues of today, especially the role of the Labour Party and the Croke Park 2 agreement. The initial bullet points gave a sense of the focus of my remarks and they I include the full text. · 100 years after the Lockout this state is only one of three EU member states in which workers have no legislated right to workplace representation – have no right to sit across from their employers and negotiate the terms and conditions of their employment. · Workers have no right to collective bargaining. · The government claimed that current legislation provides adequate protection. · Workers deserve protection and they don’t have that. · They deserve the legal protection of the government, particularly a government which has a Labour party component. · Far from protecting workers on low and middle incomes the government has aggressively gone after their increments and unsocial hours pay. · The Government threatens worse if the trade unions don’t acquiesce to this plan. · This threat, understandably opened up a dilemma for Trade Union leaders. · Is the outcome of the recent negotiations better than one which would be produced in a Government legislated pay adjustment? · Clearly some think it is. · Which means that they have little confidence in this government, and while that may well be a given about Fine Gael what does this lack of confidence say about the relationship of the wider Labour movement and the Labour Party? · What is the point of Labour in government if it is not about protecting workers and working families and promoting equality? · And what say does the wider Labour movement have in these matters? · These are difficult times. Sinn Féin understands that. · The working people of this island, and I include workers from the unionist constituency, need to hear an alternative to the right wing ideology which underpins many of our political and media institutions. · There is a battle of ideas to be won and an alternative to be forged. · Surely the leaders of organised Labour in the trade unions have a role and a duty to be part of this. I want to welcome all of our guest speakers from the Trade Union Movement; the historians, journalists, musicians and writers who are participating in this very special event celebrating ‘A century of Workers in Struggle 1913-2013’. I want to especially commend Seanadóir David Cullinane and the Sinn Féin organising committee who put a lot of time and effort into this event. The Dublin of 1913 was a city of grinding poverty and exploitation. Infant mortality was among the highest in the world at that time. Thousands of families lived in single rooms in crumbling tenement houses. Workers had no rights. They were hired and fired at the whim of employers. The children of workers had no childhood and no future. They often worked from a very young age. In my home city of Belfast at that time female and child labour predominated in the Linen Mills. Other citizens lived and worked in appalling conditions; in the Docks, the Shipyards and in casual labour. In 1911 James Connolly was appointed Belfast organiser of the Irish Transport and General Workers Union. Connolly organised the workers of Belfast and especially the Linen slaves. Ireland was also part of the British Empire. As a colony Ireland was used and abused and exploited in the interests of British capitalism. As our long history of struggle for freedom records, in every generation Irish men and women have opposed British government involvement in Ireland. But nationalists and republicans were not alone in combating the evil of colonialism. The early trade unions of the 1700s – combinations of skilled and unskilled workers –like the Belfast Cabinetmakers Club, the Regular Carpenters of Dublin, and the Ancient Corporation of Carpenters of Cork and others, all stood in defiance of those who sought to exploit their members. The first anti-union laws were introduced in Ireland in the 1720’s. But it also has to be acknowledged that colonialism and discriminatory industrial development, primarily in the Lagan basin around Belfast, and the use of sectarian politics, led to an early division among Irish trade unionists with the creation of Irish based and British based trade unions. In 1894, the year in which the Irish Trades Union Congress was established, there were 51 Irish based unions with a total membership of 11,000. British based unions had a similar number of members. But for all trade unionists the 1913 Lockout was the tipping point in modern Irish trade union history. Workers and their families and their union, found themselves in a pitched battle against the political, economic and media establishment of their day. When the Irish Transport and General Workers Union succeeded in recruiting the workers in the Dublin United Tramways, the Company proceeded to dismiss all known union members. The Dublin bosses demanded that employees across hundreds of workplaces sign a pledge never to join or associate with the ITGWU. However, in a remarkable display of solidarity thousands of workers refused to sign and were dismissed as one after another places of work closed their gates to union members. The employers had the backing of the British authorities in Dublin Castle and the Dublin Metropolitan Police. During the months of the Lockout, police and workers fought running battles, when the DMP moved against protesting workers. James Nolan and John Byrne were killed. And on August 31 the British authorities banned a mass meeting in O’Connell Street which was then savagely attacked by the police resulting in Ireland’s first Bloody Sunday of the 20th century. One consequence of this was the formation of the Irish Citizen Army. The end of the Lockout in early 1914 was inconclusive but the result was not. Poverty forced strikers back to work but far from breaking the trade union movement the Lockout saw it consolidate its strength and significantly grow in the following decades. The central issue in that dispute was the right to join a union, to organise, to be able to engage in collective bargaining. It was about the right of workers to be treated decently and fairly. Regrettably, these problems still persist. Connolly understood the importance of the connection between the national and the social. They are the opposite sides of the same coin. He famously linked the cause of Ireland with the cause of Labour - and was a fierce opponent of plans for partition. He argued, correctly, that it would create a carnival of reaction. Connolly and Pearse and the leaders of 1916 presented a vision of a different Ireland. It is found in the words of the Proclamation. These, for me, should be the guiding principles for workers and republicans and socialists and democrats today. Those are great words – great ideas. These words are a promise to every Irish citizen that she and he can share in the dignity of humankind, as equals with equal opportunity; that we can enjoy freedom, educate our children, provide for our families and live together with tolerance and respect for each other. However, the two states imposed by partition failed to deliver these principles. Both have been characterised by economic failure, by emigration, by backwardness on social issues, by inequality and by the failure to protect the most vulnerable of our citizens. Those who built this state also turned their backs on the north. They turned their backs also on the ideals of independence and a genuine republic. The Southern State that developed was in hock to the Catholic Hierarchy while the six counties became a ‘Protestant state for a Protestant people’ in which structured political and religious discrimination was endemic. Two conservative states ruled by two conservative elites in their own narrow interests. The old colonial system replaced by a neo-colonial one. And this is the context in which the trade union movement has laboured. It has been a difficult 100 years. Conditions in the north saw the emergence of a trade unionism which many republicans and nationalists viewed as largely ineffective. There are exceptions. Among them my friend and our comrade Inez McCormack who died recently. Inez was an exceptional trade union activist. She took part in the civil rights campaign in the ‘60s; was an extraordinary trade union leader; an internationalist; and a strong advocate for equality and for women’s rights. 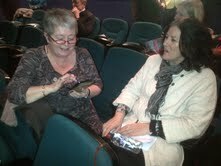 Inez spoke out against discrimination and supported the MacBride principles campaign for fair employment. She also played a key role in the peace process. I found her advice on equality and anti-discrimination measures crucial in the Good Friday Agreement negotiations. Inez was a remarkable human being and I know she will be missed by everyone in this hall. In this state workers’ rights have not been protected or advanced as they should. 100 years after the Lockout this state is only one of three EU member states in which workers have no legislated right to workplace representation – have no right to sit across from their employers and negotiate the terms and conditions of their employment. Workers have no right to collective bargaining. When Sinn Féin introduced an Employment Rights Bill into the Dáil last May it was to provide adequate safeguards for workers, including, to enhance the period of notice for workers who are to be made redundant, and to expedite the hearing and processing of claims to entitlements. Fine Gael and Labour argued that it was unnecessary. The government claimed that current legislation provides adequate protection. Does any trade unionist in this hall believe that? Ask workers from Waterford Crystal, or Vita Cortex, Visteon, Lagan Brick, Vodafone, GAME, La Senza, Diageo, HMV and many more if their rights as workers are protected. They have had to make a stand against injustice. I am pleased to welcome to this conference today some of those who made a stand for themselves and for other workers. So, I would ask the hall to give a huge welcome to workers from Visteon, from Waterford Crystal, from Lagan Brick and from Vita Cortex. Their courage is an example to us all. But they shouldn’t have been forced into taking the action they did. Workers deserve protection and they don’t have that. They deserve the legal protection of the government, particularly a government which has a Labour party component. Today the rights of workers are under severe attack. That includes the denial of a right to a job with decent terms and conditions. Unemployment is at 14.2%. Youth unemployment is 27.7%. 87,000 have emigrated in 2011 and that trend has continued. Companies are tearing up agreements with workers, arbitrarily paying them off or denying them wages or redundancy payments. It is a truism that there are employers who do not believe in wasting a good recession. During the boom of the Celtic Tiger there was a stubborn and dismissive refusal to socialise the wealth and tackle inequality. Proposals by Sinn Féin for investment in sustainable jobs, social housing, infrastructure or hospitals and schools were ridiculed. But when the bubble burst there was an immediate move to socialise the debt and to force the disadvantaged and those on low and middle incomes and other citizens to carry the burden of paying for the debts of the elites. For right wing elites a recession is an opportunity to drive down wages; sack workers; hire others at cheaper rates; cut overtime payments; demand longer hours for less, and ignore the trade unions. The austerity policies of the British conservative government and of the Fine Gael and Labour government are a part of this approach. In the last two years there have been a succession of savage cuts to wages and incomes in the south and the introduction of new additional stealth taxes, like the Household charge and family home tax; water charges; increased VAT; Increased motor tax; as well as cuts to child benefit; cuts to homehelp hours, to the carer’s respite care grant and much more. This week the gov ernment again targeted the most vulnerable in our society by scrapping the Mobility Allowance Scheme and the Motorised Transport Grant Scheme. I believe the Croke Park 2 agreement will exacerbate the austerity driven agenda of this government and that working families – those on low and middle incomes – will be squeezed again. Frontline workers have been especially and unfairly targeted. They have mortgages to pay; children to feed and clothe; school books to buy, and bills to pay. None of their outgoings are going to be cut, just their income. Far from protecting workers on low and middle incomes the government has aggressively gone after their increments and unsocial hours pay. The Government threatens worse if the trade unions don’t acquiesce to this plan. This threat, understandably opened up a dilemma for Trade Union leaders. Is the outcome of the recent negotiations better than one which would be produced in a Government legislated pay adjustment? Clearly some think it is. Which means that they have little confidence in this government, and while that may well be a given about Fine Gael what does this lack of confidence say about the relationship of the wider Labour movement and the Labour Party? What is the point of Labour in government if it is not about protecting workers and working families and promoting equality? And what say does the wider Labour movement have in these matters? These are difficult times. Sinn Féin understands that. We also understand tactics and strategy and compromise. But all of these matters need continuously contextualised in our vision for the future, our core values and our objectives so that decisions on these issues advance our vision, our core values and our objectives. If we fail to do that then we risk losing our way. This may not be a disaster in itself provided we are alert enough to find our way again, before we lose all sense of what we are about and where we are going. But we have to be constantly mindful of who we are. Where we come from. What we stand for and where we want to go. So, too with the Labour movement. The working people of this island, and I include workers from the unionist constituency, need to hear an alternative to the right wing ideology which underpins many of our political and media institutions. There is a battle of ideas to be won and an alternative to be forged. Surely the leaders of organised Labour in the trade unions have a role and a duty to be part of this. Austerity is not working. The government has alternatives – it has other options. It could have brought in a wealth tax. It could have introduced a third band of tax on those earning more than €100,000. Instead it is ordinary workers who will bear the burden – again. This is not fair. Public service workers will decide your position on the Croke Park proposals. That is a decision that you will come to. We wish you well in your deliberations. But whatever the outcome of those deliberations it is important that you know that the trade union movement today is needed more than ever in the Ireland of the 21st century. Workers are looking to their respective unions for leadership and hope and solidarity in the difficult time ahead. And we will continue to work with you in securing protection for workers and policy changes that will enhance the quality of life of all Irish citizens. Today’s event is part of Sinn Féin’s contribution to the centenary of events that marked the second decade of the 20th century. 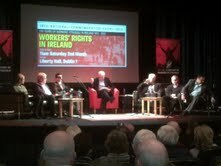 It is a packed schedule of debate and discussion with many excellent contributors, including Brian O Donoghue from LIUNA.